The novel opens with Reuben’s ecstatic return to London: 'he was back again: back to the old, full, strenuous life which was so dear to him: to the din and rush and struggle of the London which he loved with a passion that had something of poetry in it.' After making a prodigious start as a lawyer we learn that 'the beloved son' of 'an old lady whom it would be difficult to kill' has had a nervous collapse and 'gone off grumbling to the antipodes'. On his return he is exhilarated, but by the end of this slim volume London kills him. Reuben Sachs surprises in several ways: it turns out that the title is deliberately misleading and Levy’s real interest is not Reuben but a character called Judith, who loves him but whom he does not marry because of his ambition and because his mother insists that Reuben 'will do nothing rash'. As a result the woman he loves is sacrificed on the altar of Jewish patriarchy. Amy Levy was what Gissing would have called an odd woman: like Rhoda Nunn she was unmarried and intellectual. The daughter of a well-to-do orthodox family, she was born in Clapham in 1861 and educated at Brighton and Hove High School for Girls, which was founded by feminists. A major theme of her journalism, and of Reuben Sachs, is the oppression of women by the Jewish community. But in comparison with Virginia Stephens, born twenty years later, Amy Levy’s education was emancipated, with a rigorous schooling which gained her entry to Newnham College, Cambridge in 1880. Woolf would have considered herself lucky but, tragically, Amy Levy still died in a room of her own at the age of 28. Despite losing her faith she seems to have enjoyed the support of her family; she also achieved some success as a poet, publishing her first collection, Xantippe, about the wife of Socrates, when she was only 20. Apart from two years at Cambridge and travels to Germany, Switzerland and Italy, she spent most of her brief life in London, writing poetry, journalism and three novels. For the most part the great female novelists of the nineteenth century – from Austen, through the Brontes, to Mrs Gaskell and George Eliot -- use provincial locations and there are few great nineteenth century London fictions by women, perhaps in part because they did not have the freedom of the metropolis in the same way as men. The tolling of Big Ben on the first page of Mrs Dalloway signals a major shift: as 'the leaden circles dissolve in the air' the heroine sets out on her walk through Westminster without the remotest possibility of being mistaken for a streetwalker. Although Woolf was a dedicated reader of lost female fictions, she seems not to have encountered Reuben Sachs in the stacks of the British Library. Looking back, the novel that Amy Levy has in her sights is by a woman: Daniel Deronda, which Levy saw as a ludicrously philosemitic fantasy, as if George Eliot were a nineteenth century Julie Birchill who could write. Amy Levy is remembered now, if at all, for A London Plane-Tree and Other Verse (1889) which carries the epigraph: 'Mine is urban muse and bound by some strange law to paven ground.' In this sense she is like her eponymous character, and London in 1888, when the novel was published, must have seemed full of possibility: post Emancipation, Reuben aims to be the first Jewish MP who doesn’t have to convert in order to be elected (unlike Benjamin Disraeli). He attends endless committee meetings for the benefit of 'the Community' while biding his time until a Conservative seat falls vacant. But in order to succeed he believes he has to marry money: he renounces his love for Judith; a betrayal which leads to his early death from a heart attack. For Amy Levy, surrounded by friends such as Clementina Black, Olive Schreiner, Margaret Harkness and Eleanor Marx, the Reading Room at the British Library must have offered the dream of independence, but in the end, for any number of reasons (because she was a woman, a Jew, a lesbian or a depressive) it didn’t turn out that way. In vehement contrast to Reuben, his cousin Leo hates London: 'It was the place, he said, which had succeeded better than any other in reducing life to a huge competitive examination'. Leo, who against his family’s wishes, wants to be a musician, prefers Cambridge; a purer city, in his estimation, untainted by materialism. A key scene in the novel pits Leo, who is appalled at what he considers to be Jewish greed and vulgarity, against Reuben who asks: “Have you forgotten for how long, and what a cruel disadvantage, the Jewish people has gone its way, until at last it has shamed the nations into respect?” In the light of the Holocaust Reuben’s question seems cruelly ironic. But at the time of the novel’s publication, when thousands of Jews were fleeing the pogroms in Eastern Europe, it must have seemed as if Levy herself were begging the question of what to do about the refugees who were living in poverty in the East End, about whom she is completely silent. Amy Levy combines elements of both her male antagonists. Like Leo, she was an artist and had studied at Cambridge; although for some unknown reason she didn’t stay the course. Perhaps the strain of being a Jew and a woman was too much for her; both were new to the university and encountered considerable prejudice. Like Reuben, she seems to have loved London, although she committed suicide in the family home in Bloomsbury not long after Reuben Sachs was published and attacked in The Jewish World as a work of self-hating anti-Semitism. Judith, in contrast, is nothing like her creator: she is unbookish, clannish, and conservative. Perhaps the most surprising aspect of the novel is the way Levy focuses sympathetically on a character apparently so unlike her own. When, eventually, Judith realises the horror of her situation she turns in desperation to poetry, even though she doesn’t understand it. Having been rejected by Reuben, she marries a Jewish convert, Bertie Lee Harrison; she doesn’t love or even respect him but his wealth cushions her from the contempt her community reserves for failures. The novel ends with the intimation of her pregnancy: 'the germ of another life […] and that quickening of purpose which is perhaps as much as any of us should expect or demand from Fate. 'As the novel comes full circle pessimists may assume that Judith will place her faith in her beloved son and ruin his chance of happiness as Reuben’s mother destroyed his and her own. With a poet’s concision Amy Levy creates a vivid impression of the West End in the late nineteenth century; a time when British Jews were beginning to assume important roles in public life despite facing considerable prejudice and anti-Semitic stereotyping. Like a poor relation in a Jane Austen novel, Judith’s family have given her up for adoption to their cousins, the wealthy Leunigers, who live in Kensington Palace Gardens: much of the action takes place in their drawing-room, 'hung with primrose coloured satin, furnished throughout in impeccable Louis XV and lighted with incandescent gas from innumerable chandeliers and sconces'. It is the scene of parties and dances but where her aunt looks out 'with two dark, restless, miserable eyes'. Although the Leunigers are kind to her, Judith will not have the same dowry as her plump and good-natured cousin Rose, who is destined to succeed in the marriage market, although she may well end up 'a creature in pain' like her mother. Pressured into loveless marriages the women find consolation in their children and before they are married in shopping in Whiteley’s department store in Bayswater, the 'happy hunting ground' of bargains. Once Judith realises how much difference money makes she returns to her family on the Walterton Road: 'a dreary thoroughfare […] lined with little sordid gray houses.' Her father, Joshua Quixano, is from an aristocratic Sephardic family, 'who had been stranded high and dry by the tides of modern commercial competition' and has reverted to the 'ancestral pursuit' of scholarship – 'one of the pure spirits of this world' but so shabby and dusty that Judith soon returns to the meretricious glamour of Kensington Palace Gardens. Reuben’s chambers are in New Square, off Lincoln’s Inn; he relishes the 'democratic' bustle of Chancery Lane and the opportunity to succeed outside 'the tribal duck pond'. But he goes home to the 'Philistine splendour' of his mother’s house in Lancaster Gate where he is expected to conform to traditional Jewish norms; to be a dutiful son and marry the wealthy heiress Caroline Cardozo. Levy’s Londoners are acutely conscious of postcodes. 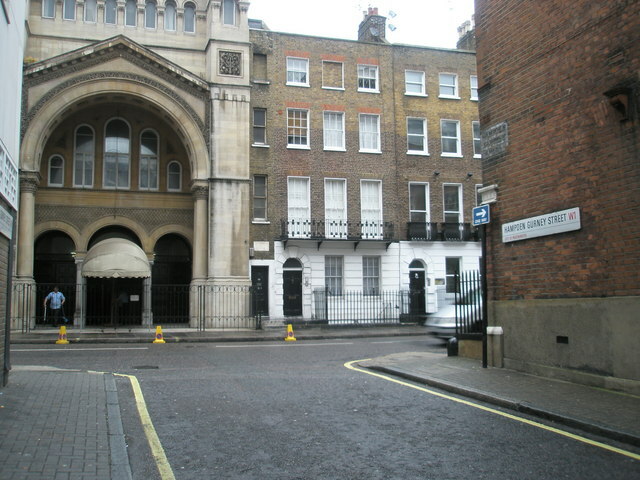 The unsuccessful Samuel Sachs family are viewed with contempt because they live in Maida Vale: they are admitted into 'the charmed circle' on feast days but are mocked for using 'tribal phrases', such as barmitzvah and shool, which are considered 'bad form' by their more sophisticated relatives, who want to be accepted by upper class gentiles, although they would rather die than see their children marry one. “Blessed art Thou, O Lord my God, who hast not made me a woman.” No prayer goes up from the synagogue with greater fervour than this. Above: Bayswater synagogue, demolished 1965. 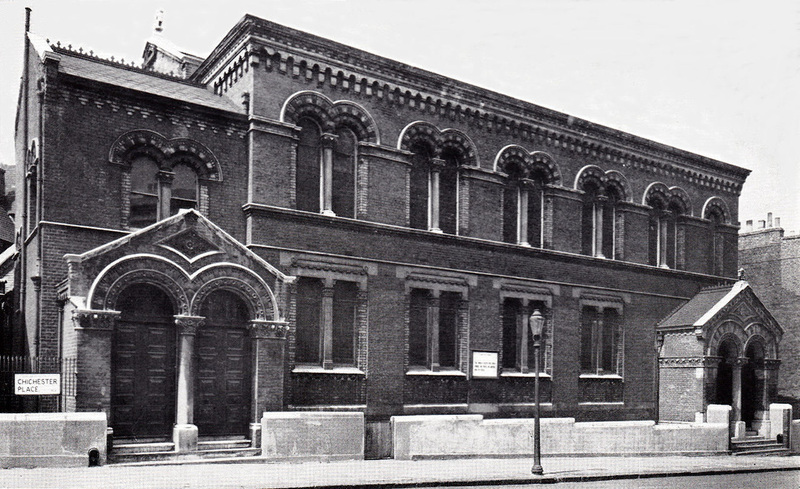 Right: West London Synagogue, Upper Berkeley Street - photo Basher Eyre, Creative Commons. She found a friend in Oscar Wilde, an Irish exile, who was sacrificed on the altar of John Bull for his socialism and his homosexuality. In 1889, in the Woman’s World, a magazine to which Levy had contributed, he wrote of Reuben Sachs: 'Its directness, its uncompromising truths, its depth of feeling, and, above all, its absence of any single superfluous word, make it, in some sort, a classic.' Wilde had changed the name from The Lady’s World because he didn’t consider this applicable to 'a magazine that aims at being the organ of women of intellect, culture and position.' He was so successful in his aims that not only did the magazine feature articles on feminism but his wife contributed pieces on rational dress and his mother complained that he hadn’t praised her poetry sufficiently in its pages. It is probably not surprising that Wilde soon lost interest in it. Nonetheless, I like to imagine him stepping down Fleet Street to Ludgate Hill, to the Belle Sauvage Yard where Woman’s World had its offices, taking Amy Levy by the hand. Susie Thomas is Reviews Editor at The Literary London Journal (http://www.literarylondon.org/london-journal).